The big question: how much will it impact the game, and in what ways? For a quick answer to that question, here’s a little history involving the 10 coldest games in NFL history. Video (02:37) : Frigid weather is headed our way. Paul Douglas lets us know how long it will stay. The average high temperature in Minneapolis on Jan. 10 is 23 degrees. That’s cold, but anyone who lives in Minnesota will also tell you that 23 is more or less bearable. You can function without extreme discomfort, while dressed appropriately, at 23 degrees. You can even enjoy a lot of outdoor activities. The expected high temperature on Sunday, Jan. 10, 2016 — otherwise known as this Sunday, and also known as the date of the Vikings/Seahawks playoff game — is 0 degrees. None. No degrees. As in, 23 degrees colder than average. So Sunday will not just be cold. It will be extremely cold for a place that is already extremely cold. That will affect people merely walking outside for one minute. It will certainly affect fans who choose to attend Sunday’s game. And most most importantly, it will definitely have an impact on how the game itself is played. *In researching the 10 coldest games in NFL history, as defined last year by Yahoo, I found the road teams won five times while the home teams won five times. Two of those games were played in Minnesota in 1972 — a Vikings win over the Bears and a Vikings loss to the Packers. Quarterbacks in those 10 games combined to complete just 51 percent of their passes, while the teams combined for a total of 50 turnovers — five per game, 2.5 per team. 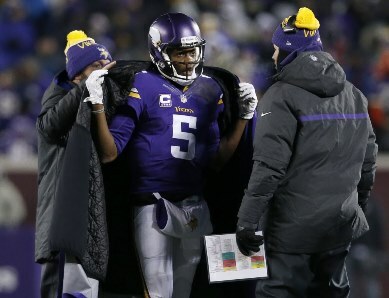 In the five coldest games, all of them playoff games, the completion percentage for quarterbacks dropped to 48.7. *In the five coldest games, again all of them in the playoffs, the average total points scored by both teams combined was 30.4, and four of the five games were decided by four points or less: 20-17 Giants over Green Bay in the NFC title game after the 2007 season, 14-12 Raiders over Browns in 1981, 10-7 Colts over Chiefs in 1996 and 21-17 Packers over the Raiders in the famed Ice Bowl of 1967. *In the two coldest games at TCF Bank Stadium, which also both qualify among the 10 coldest home games in Vikings history, the Vikings defeated Carolina 31-13 in 2014 (game-time temperature 12 degrees) and beat the Giants 49-17 two weeks ago (game-time temperature 13 degrees). Teddy Bridgewater was a combined 30-for-46 (65.2 percent) with three TDs and no interceptions in those games (all of which came while throwing right-handed). Opposing QBs Cam Newton and Eli Manning were a combined 33 for 64 with a TD and four INTs. The Vikings scored twice on blocked punts against Carolina and once on a pick-six against the Giants. Conclusion: The Vikings’ sample size is far too small with too many variables to read too much into it, but the larger sample of cold-weather games suggests what one might suspect: it very well could be a challenge to throw the ball and to score points on Sunday. Considering Seattle’s recent potent passing attack, the weather could then provide some measure of an edge to the Vikings. Strangely enough, in this specific matchup and instance, Minnesota should be glad it is playing in its temporary outdoor home instead of its soon-to-open indoor palace. Gallery: Remember those old, cold Vikings games?